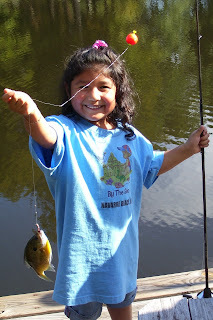 This past weekend my family and I along with some friends got invited to fish at Lakewood. This is the same place I have been fishing and telling our readers about. 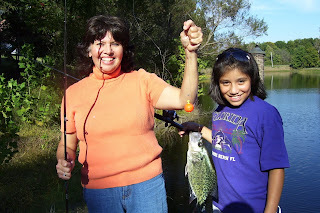 In the pictures you will see my wife(and a friend) with a slab crappie she caught. My daughter is in another picture and our friend's daughter is in the other picture. 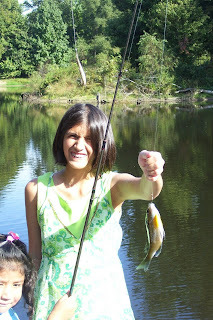 We fished off the dock and caught between 30 and 35 bream,bass and crappie. This lake is located across the street and just down about 50 yards from the lot I just listed at lakewood(I discussed this lot in last post). I believe if you built a 2-story home on this lot you could view the fishing on part of this small lake. Lakewood is so peaceful and quiet and the residents very nice and friendly. If you are considering relocating to a great area of the country and want lakefront or lake access, then look no further than Dyersburg,Tennessee and the Lakewood community.